High-Definition Multimedia Interface (HDMI) cables allow electronics users to connect certain devices, like high-definition stereo surround sound systems or high-definition displays. In order to get the full effect of picture quality from an HDTV or the best quality sound from an HD sound system, these devices must utilize HDMI cables. HDMI cables allow for the transfer of uncompressed digital data from HDMI-compliant source devices to compatible devices. These include audio and visual outputs, such as HDTVs and some sound sources. By fully researching available product options for HDMI cables, shoppers can get the cable type and length that they need on the first try. When searching for HDMI cables, make sure to research cable product availability. Also learn about the different types of cables, how they work, and storing, mounting, and labeling options for HDMI cables. Development of the original HDMI format began in 2002 with HDMI 1.0. Designed to improve upon the DVI technology being used at the time, initial HDMI cables used a smaller connector, in addition to adding support for audio, a capability that DVI doesn't have. The HDMI format has surpassed all other forms of technology designed for the transfer of high-definition media and is now included as a standard on nearly all HDTVs. HDMI cable specifications have gone through various numbered versions, which is currently HDMI 1.4 as of November 2010. HDMI 1.4 adds support for 3D content, as well as offering the new micro-HDMI connector, and Ethernet capability, giving Internet-ready devices access to the medium. Shoppers looking for the best in high-definition output should have an idea of what they need in an HDMI cable before purchase. 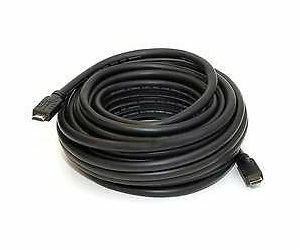 The following sections describe the makeup of HDMI cables, the different types, the most common lengths available, how to store them, and how to find them online at eBay. Knowing how an HDMI cable is made and the way in which it works gives shoppers a better understanding of HDMI cables in general. This, in turn, allows shoppers to make more informed choices when shopping for HDMI cables to connect their devices. HDMI cables have at their heart a copper wire in four shielded twisted pairs. This copper wire is surrounded by multiple layers of shielding and protective material. The cable carries the high-definition signal from the HDMI-compliant source device to the receiver, which is located within a compatible device such as HDTVs. Also keep in mind the connectors on the ends of the cables when buying HDMI cables. There are five different cable types designated in the various specifications, from A to E. The list below includes the five different types of HDMI cables and their specification, number of pins, and description. 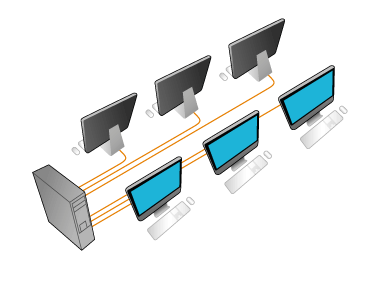 Supports all modes of bandwidth: SDTV, EDTV, and HDTV. Electrically compatible with a single-link DVI-D.
Used for very high-resolution future displays. This type of HDMI cable is compatible with a dual-link DVI-D.
Intended for portable devices, the mini-HDMI is smaller than the type A connectors above, even though it has the same configuration with 19 pins though they are assigned differently than type A. Shrinks the connector size down, and even though it keeps the 19-pin standard, the pin assignment is different from a 19 pin A or C connector. A connector used in automotive applications. One of the features of a type E connector is a locking tab, which prevents the connector from coming loose due to vibration. It is also protected from moisture and dirt with a hard shell. Shoppers should know what kind of application they need HDMI cables for so that they can choose the best HDMI cable for the device at hand. HDMI cables are available for different speed applications, from standard to high speed, both with and without Ethernet capabilities. Listed below are the different types of HDMI cables and details about each. Delivers high definition with a resolution of up to 720p/1080i. This is fine when it comes to DVDs and TVs with resolutions of 1080i or lower. A high-speed HDMI cable allows users to take full advantage of Blu-ray and HDTV, all with 1080p resolution. Same as standard HDMI cables above, except able to connect to the Internet via Ethernet capabilities. It also helps the functionality of streaming video from online sources. Combining the fastest HDMI cable speeds with Internet capability. As standard HDMI cables above support Internet connectivity, high speed HDMI cables allow for the streaming of high-definition content from the Internet. High-speed HDMI cables are recommended, as this allows for higher resolutions if a shopper buys a better HDTV at a later time. In other words, high-speed cables are compatible with lower-resolution devices, but standard HDMI cables will not work with higher-resolution HDTVs and monitors. Cable length is largely dependent on signal attenuation, which itself is determined by the quality of construction of the cable and the materials involved, especially those that conduct the signal. The maximum length for current standard HDMI cables falls somewhere around 16 feet, while high-speed HDMI cables can run up to 49 feet in length. For longer capabilities, the range of HDMI cables can be extended through the use of amplifiers, equalizers, and repeaters. The table below gives information on all three devices. Amplifiers increase the power of the HD signal without altering it in any significant way. Helps equalize a signal, eliminating severe attenuation distortion. Repeaters are able to boost signals to get around obstacles or over long distances. Knowing the distance that needs to be covered or of any obstacles that could prohibit a digital HD signal will allow shoppers to purchase devices such as amplifiers, equalizers, and repeaters to improve their overall HD experience. Storing and mounting excess cable can make an area less cluttered and thus safer for any potential foot traffic. In the same vein, labeling HDMI allows shoppers to more easily keep track of which cables are for a specific device. The sections below details potential storage, mounting, and labeling solutions. Shoppers can use a variety of storage solutions to safely contain excess cables. These options are listed in the table below. Long cable boxes allow for the safe storage of HDMI and other cables. Slots in the box give easy access and hookups for the various cables within. Staples allow cables to be mounted along a baseboard or wall, keeping them out of the way. This is especially useful when running the cable for a long distance. Zip ties allow for excess cable to be bundled up, keeping it neat and out of the way until needed. Labels allow shoppers to designate what cables go where, so that cables going to specific devices are not accidentally mixed up. Using the methods suggested above, shoppers can keep their various HDMI cables out of the way and properly labeled so that they know which cables go to each specific device.